Blog post Why are chillies hot? And why do we like them so much? There is an arms race going on. Farmers are competing to breed the hottest chillies ever, with terrifying names such as Trinidad Moruga Scorpion and Carolina Reaper. Sauce manufacturers are selling more and more potent hot sauces, some of which have to have “not for people with respiratory or heart problems” warnings on the label. It seems as though humanity’s quest for hot, searing pain is never ending. But, why are chillies hot and why do we like them so much? 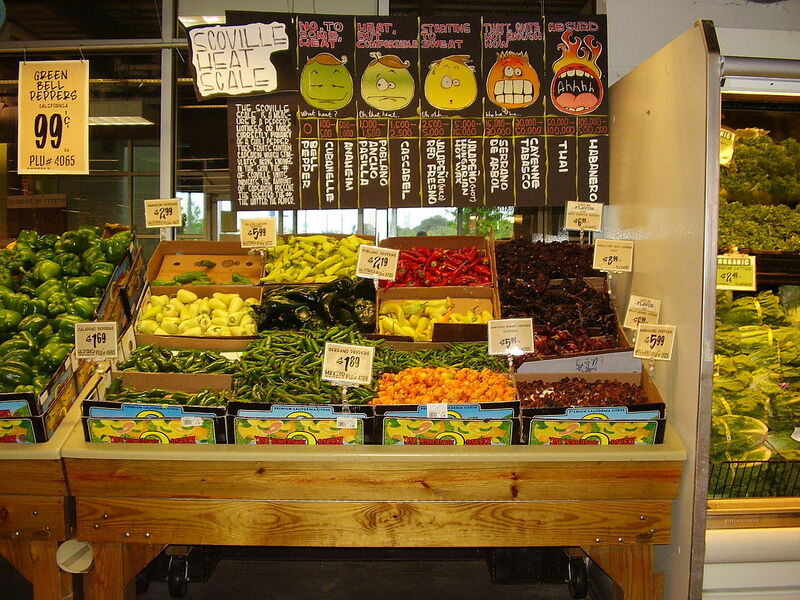 Chilies, or chilli peppers or chile peppers, are the fruits of a plant that originates in South America. Before the “discovery” of the Americas in the late 15th century, they were unknown to Europeans, Africans and Asians. Chiles are known as peppers because when Europeans first encountered them they equated their effects to that of black pepper, which originates in southern India and botanically has no relation at all to chillies, whose proper scientific name is capsicum. The key ingredients in the spiciness of chili peppers are capsaicin and other related chemical compounds (known as capsaicinoids). Capsaicinoids are produced in by the surface cells of the placenta (the pithy white tissue inside the chillies). They accumulate in droplets under the surface. These can burst and spread to the inner walls and the seeds. There is much less capsaicin in the flesh of the chilli, which is why it is advised to scrape away the seeds and the placenta when we want the flavour of chillies without too much spiciness. Capsaicin is quite oily and hydrophobic and hence quite hard to wash off, which often causes us to spread it on less pleasurable areas of our body like our eyes, ears and nose (and sometimes to other, ahem, more private areas). Capsaicin is used in pepper sprays, as it causes breathing difficulties and blurred vision for an hour or so. Capsaicin, in mammals, triggers the TRPV1 (transient receptor potential cation channel subfamily V member 1), which is also known as the capsaicin receptor. This neuroreceptor is activated not only by capsaicin, but also by heat (over 43 degrees Celsius), acidic conditions and the organic compound Allyl isothiocyanate which is found in wasabi, mustard and horseradish. When this receptor is activated it causes a strong sensation of pain and heat. In fact, eating chillies fools our brain into thinking our mouth is on fire. Unlike fire, however, capsaicin does not cause any damage. It merely causes the temporary illusion of pain. So we have answered why, chemically, spicy food is spicy. But a more interesting question is why chillies have evolved the production of capsaicin in the first place. There are a few hypotheses. The most commonly argued is that capsaicin is a very good mammal repellant. Mammals chew and destroy the seeds of the plant in the process of eating it. However, birds swallow the seeds whole and hence can spread them — intact — far and wide. Birds also lack the neuroreceptors with which capsaicin interacts, so chillies do not have the same effect at all on them as on mammals. It seems as though chilli plants have evolved spiciness as a way to select which species of animals eat their fruit to maximise the spread of their seeds, to “discourage seed predators without deterring beneficial seed dispersers”. Counterintuitively, humans’ fondness for chillies has contributed far more to their spread than birds ever have. Another hypothesis is that it is simply another defensive chemical. Capsaicin has been shown to inhibit the growth of fungi and is also an insecticide. Chilli plants at a higher risk of fungal infection or being eaten by insects produce fruits with a higher concentration of capsaicin. 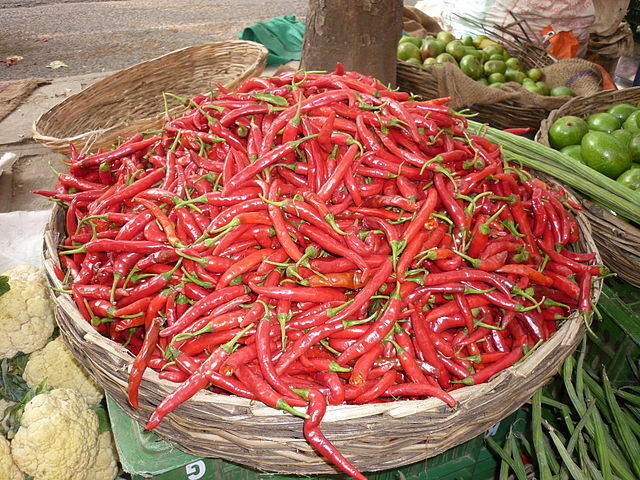 This has been used by some farmers as a way to produce hotter chillies. The Australian farmers cultivating the Trinidad Scorpion Butch T apply “worm juice”, the runoff from a worm farm which contains plenty of bits of insects, to the roots of the plants. The plants, supposedly thinking they’re under attack, produce more of the hot stuff. Which of these two explanations is the right one? Probably a mix of both, we’re not entirely sure. How hot is a chili pepper? 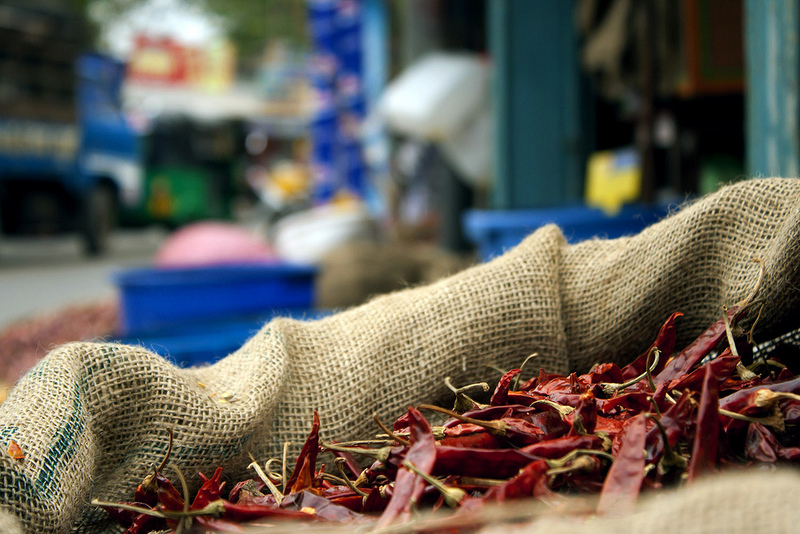 The “hotness” of chillies has traditionally been measured using the Scoville scale, first devised in 1912. An extract of the chilli oil is diluted until a panel of five tasters can no longer feel the heat. It’s not a particularly accurate scale as it relies on human tasters, the results vary widely between panels. The hottest chile ever tested clocked in at a blisteringly painful 2.2 million Scoville Heat Units (SHUs). In comparison, Tabasco sauce, reaches a miserably plain 2500-5000 SHUs. Why do humans like chillies so much? Filming yourself eating a ghost chilli, one of the hottest cultivars at over 1 million SHUs, is up there with other silly Youtube trends, such as eating a spoonful of cinnamon or chugging a gallon of milk. It usually ends in tears. One could infer that we like chillies so much because they cause us such pain. However, there are many other things that cause us pain (such as walking into lampposts or stabbing yourself in the leg) that most of us don’t do on a regular basis. It’s been suggested that we like the heat of chillies because it gives a controlled thrill (as discussed before, capsaicin gives us the illusion of pain). We like riding roller-coasters and watching horror movies but we’d be quite scared if we were on a stalling plane or actually stalked by a serial killer. One is a controlled thrill, the other is not. So, maybe, we like chillies because they give us a similar sensation. Paul Rozin, professor of psychology at the University of Pennsylvania, calls it “benign masochism”. Under this term he groups various activities that are initially disgusting, painful or unpleasant which we then grow to like. These include eating spicy foods and stinky cheeses, getting painful massages, riding roller coasters, watching sad movies, listening to sad music and exercising until physically exhausted (“It hurts so good”). All activities loathed by some and treated as a pleasure by others. Everaerts W, Gees M, Alpizar YA, Farre R, Leten C, Apetrei A, Dewachter I, van Leuven F, Vennekens R, De Ridder D, Nilius B, Voets T, Talavera K (2011) – “The capsaicin receptor TRPV1 is a crucial mediator of the noxious effects of mustard oil”- Curr. Biol. Yes! The last time the reaper gave me a cup to drink, his bony fingers scratched my lower lip and gave me a cold sore, i ate cole slaw to make it better, and a guy called Saul told me a bit about law, Cold’s Law to be specific. It was hotter than a scotch bonnet, and gave Scoville the shits for more than a week.